On December 4th 2012, the new Directive 2012/27/UE on Energy Efficiency entered into force. Member States are required to implement this Directive by June5th 2014. All EU-28 countries are therefore required to use energy more efficiently at all stages of the energy chain – from the energy acquisition to the distribution to its final consumers. Energy efficiency has proved to be a cost-effective strategy for building economies without necessarily increasing energy consumption. Moreover reducing energy use means reducing energy costs and may result in financial savings to consumers, if the energy savings offset any additional costs of implementing an energy efficient technology or other investments linked to its core business. In many countries, energy efficiency is also perceived as a national security benefit because it can be used to reduce the level of energy imports from foreign countries and may slow down the rate at which domestic energy resources are depleted. In an industrial, residential, tertiary and farming context, the energy efficiency represents the capacity to use the whole inlet energy to satisfy all needs, in the best way. That means to reduce energy waste to the minimum, using the best technology available (BAT) at that moment. It is not easy to define energy efficiency in a context, because every context is different from others, both in terms of the way to use energy and in terms of how energy is used to produce a good; consequently every reality has to be analyzed as a separate case. 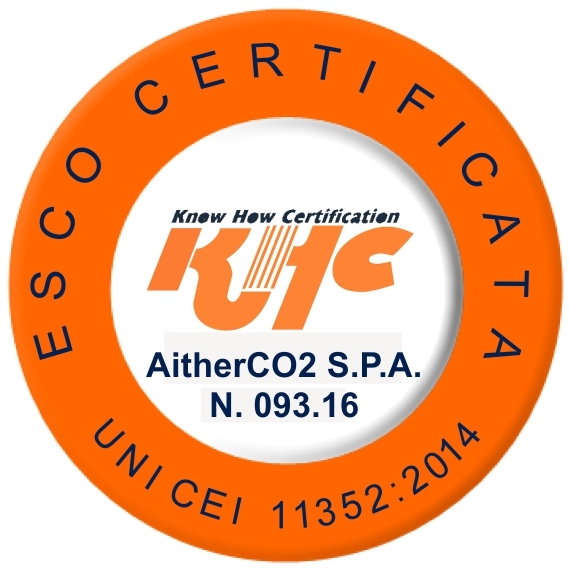 AitherCO2 is able to support prospective clients to perform this analysis and find technical, financial and economical solutions, starting from the first step (Walk Through Audit), passing through the second step (Investment Grade Audit), up to the last step (realization of efficiency intervention, finding the right financing if needed and White Certificates getting and trading).